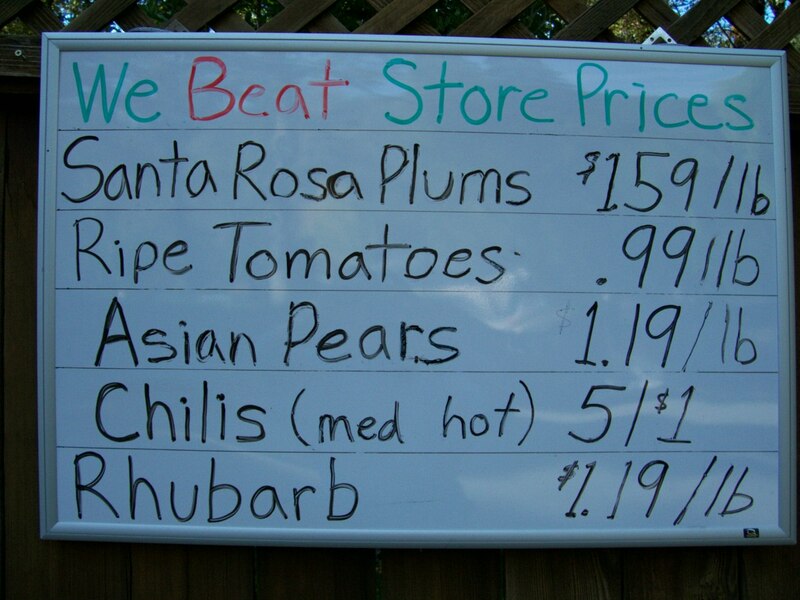 When you have grown more produce than you want to eat fresh, freeze or can, sell the surplus to passersby. Match your local grocery store prices if you want to be competitive, even though you know yours tastes so much better and is worth double maybe. Let’s say you have a couple hundred juicy plums more than you want to preserve by any method. Try selling them at $2 per lb. If they move too quickly and you feel you can get more for them, raise your price. If you aren’t getting rid of them fast enough, lower your price. This is a basic supply-and-demand, “what the market will bear” experiment. You need to maintain your reputation for good quality, you don’t want spoilage, and you want to make a little profit to help pay for a better rototiller. When in doubt, round your asking price down because it is more blessed to give than receive. And of course give your regular customers and bulk buyers a little discount. Play it by ear. Eat plums until you turn into one. Take a few sacks to your church or club. Too much produce is a glorious thing just like too many flowers. This entry was posted in Uncategorized and tagged gardening, grow fruit, grow vegetables. Bookmark the permalink. Fresh from the Garden in Winter?